MeetingSift is an easy to use collaboration platform that helps meeting hosts better facilitate group processes in in-room and remote meetings of all sizes. Combine interactive group activities and slides. Via email or meeting code. Guide the meeting by following the agenda step by step. Build meeting agendas by combining interactive group activities with presentation slides. Create text, image, and video slides in MeetingSift, or import slides from other presentation platforms like PowerPoint and Keynote. Focus the discussion and inform participants by displaying real-time graphs and summaries of group activities and collaborations. Stay on time by tracking overall meeting time, as well as the time spent on individual agenda items and group activities. Have one, or more, note takers easily capture meeting minutes and collaboratively record the outcomes of the meeting. Easily build a list of tasks assigned to team members during the meeting, making sure all action items are recorded for follow up. Receive a summary of meeting participant contributions, decisions, minutes, and task assigned, ready for sharing after the meeting. 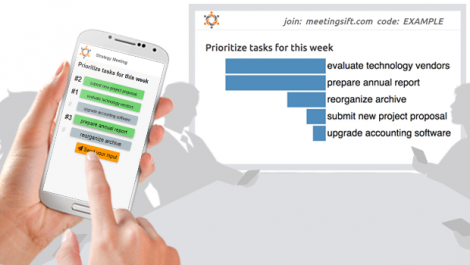 MeetingSift helps structuring and guiding collaboration at meetings, based on established best-practice group and meeting facilitation methods. Structuring collaboration has proven to: increase group efficiency; enhance group creativity; yield higher quality group results. 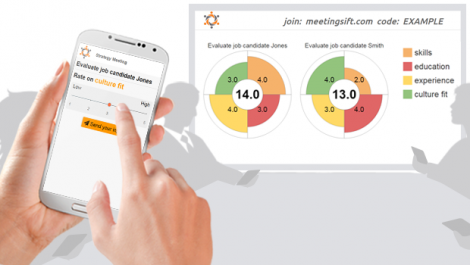 Use MeetingSift to engage all meeting participants equally, benefiting from all the knowledge and smarts present. Engaging all participants has proven to: increase individual job satisfaction; boost individual productivity; ensure buy in & alignment with organizational goals; reduce resistance to organizational change. MeetingSift helps overcome timidity and office politics by providing a safe anonymous way to share input at meetings. Supporting anonymous participation has proven to: help focus on issue, not person; increase participant engagement; provide candid input & feedback; improve both contribution quantity & quality. 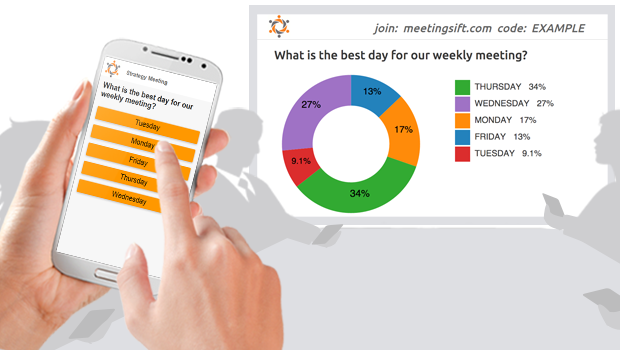 By following the agenda, and providing a shared real-time visualization of collaboration output, MeetingSift helps you and your meeting participants stay on track as well as focus on the current issue. MeetingSift tracks and displays the time spent on each agenda items take, and the overall running time of your meeting. This helps you manage time during the meeting, as well as review how much time was spent on each item after the meeting is over. Live visualizations of group collaborations provides immediate feedback and results that feeds back into the discussion. In addition MeetingSift provides automated meeting reports as soon as the meeting has ended. 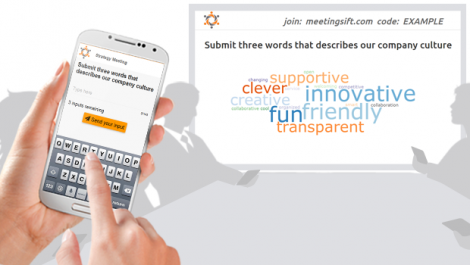 MeetingSift is an online program delivers a meeting experience that engages attendees with collaborative activities like Brainstorming, Polls, Top Picks, and Q&A that captures ideas and presents them with Active Meeting technology. An activity is an interactive agenda item (ex. Brainstorm, Poll, Evaluate, etc), where your meeting participants can collaborate, submitting their individual input, and view the group output instantly. Slides are not considered activities. All activities are anonymous by default. The one exception is the Calculate activity, where you have the option to display participant names next to their input if you request them to input their names. As a meeting leader you can determine anonymity. Participants will see an icon indicating if an activity is anonymous or not. How quickly can we view the results? Group results are immediate and will typically display in less than 1 second, depending on the quality of your Internet connection. Meeting reports are generated at the end of each meeting and provide an overview of each activity in the meeting with participant input and group output. Can I run the same meeting multiple times? No. Each meeting is independent. However, you can make copies of your meeting which will duplicate the same meeting with all the same agenda items. You can also make the meeting into a template, which allows you to reuse the same meeting agenda for any future meetings. What is a meeting agenda template? A meeting agenda template is a copy of a meeting that can be saved under “Templates”, which retains all the agenda items, branding, and preferences of the original meeting. This way you can use it again for future meetings, or share with other team members. How do people participate in a meeting? Participants need a web-enabled device to participate in MeetingSift activities. We recommend letting people know beforehand that the meeting will be interactive and encourage them to bring their mobile device, tablet or computer. 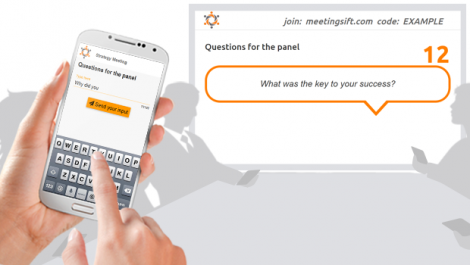 Once in the meeting, all participants need to do is go to MeetingSift.com, type in the participant code associated with your meeting, and click the “join the meeting” button. What if participants don’t have a smartphone - can they use a laptop or tablet? Yes. Participants can join a MeetingSift meeting from any device that has a web browsers and internet connection. Do participants need a MeetingSift account? No. Participants can access your meeting by going to MeetingSift.com and entering the participant code for your meeting or event. Can participants share a device? We recommend that each participant have their own smart device (smartphone, tablet, laptop, or desktop computer), as each participant logged into the meeting can only participate once in each activity. Do all participants have to be in the same room? No. Your participants do not need to be in the same location. They can access the meeting remotely from any web browser. Participants can use any modern web browser (IE, Chrome, Safari, Firefox) with an internet connection or mobile coverage. Does my IT team need to get involved? No, there is no software or hardware involved. All you need is an Internet connection and a browser. Is there anything I need to download or install? No downloads or installations are needed. All you need is Internet connection and a browser. Can I use MeetingSift with my WebEx, GoToMeeting or other conference tool? Yes. 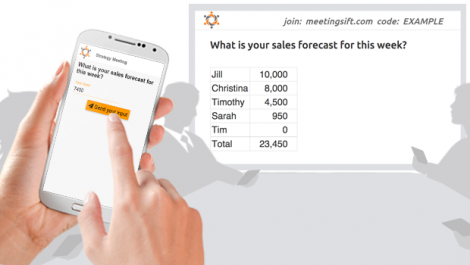 MeetingSift can easily be used with web, video and audio conference tools for remote meetings. Our recommendation is you would screen share our Shared Display Screen in your web conference tool so your participants can view the live visualization results. Can I use MeetingSift with Powerpoint slides or other slide presentations? Yes, you can import your existing Powerpoint presentation, Keynote presentation, or other presentation formats into MeetingSift. Simply export and save your presentation as a PDF file and then import it into MeetingSift. Have more questions about MeetingSift?